News from the stores: Flint Knapping and other Stone Age adventures. 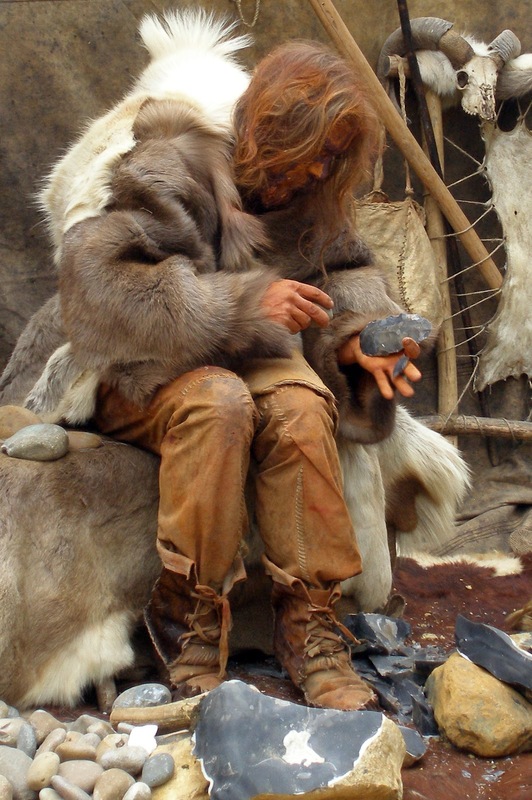 Flint Knapping and other Stone Age adventures. Our recent meeting with a skilled experimental archaeologist, Flint Knapper Will Lord, was one of the high points in our re-display programme for me. We had arranged with Will for him to come to Bedford so that we could film him making flint axes. Born in 1970, Will Lord grew up on the English Heritage site of Grimes Graves, a prehistoric flint mine in Norfolk, where his parents were custodians for many years. With a strong family history of archaeology and flint knapping, he continued & progressed the tradition, becoming the leading expert in prehistoric survival skills. Will Lord says; “We can all benefit from reconnecting with the past and learning from our distant ancestors. Their secrets can help to ground us.' Will may look a little scary, but he has a unique ability to open up a window on what life was like for our stone age ancestors. I was anxious to begin with because the weather was not brilliant, overcast with drizzle and so cold you could see your breath, and I had no idea if we would all get along with each other. My worries were totally unfounded, it was a brilliant experience and a real education. Since we closed to the public a while ago we have all been working to a tight schedule. We packed up all of our collections, which included those in our stores as well as the items on display, we moved ourselves out of the building and set up temporary offices in the town centre. Once here we began to design the new displays, looking at different objects to display and new ways to interpret them. We then moved ourselves and the collections back into the museum building whilst continuing to work on producing the new displays for the numerous cases in the galleries. It is an exciting opportunity but it does seem a bit like being on a high speed train going on a long journey. When I started to look at ways of displaying the items in the Stone Age case it became obvious that the ancient flint tools that we are familiar with today would have been very different when they were new. The hand axes we have in the collections are incredibly old for a start, 300,000 years old. They have been churned around in the gravel deposits of The River Great Ouse which means that if they are not broken they have been rubbed smooth. In some instances they have almost been transformed into unique pieces of art as they have become stained orange and yellow by minerals present in the gravel. The broken Paleolithic hand axe on the left was found at Kempston. The surface of the flint is stained from minerals present in the sand and gravel. The black fresh looking hand axe on the right is the one made by Will Lord at about 12.40pm on Tuesday 26th February 2013. Illustration of how a Paleolithic hand axe would have been held. When new the fresh, sharp edges would have easily cut through skin and flesh of large animals. The sharp point could also have been used as a very effective hammer to split bones and extract the marrow. 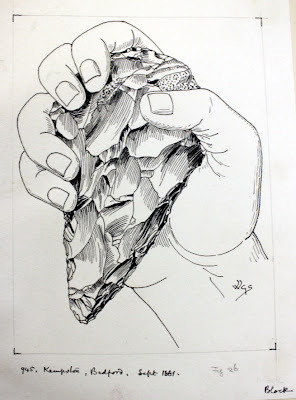 This illustration of a Paleolithic hand axe found at Kempston in September 1861 was hand drawn by Worthington George Smith. This illustration forms part of the Worthington G. Smith Collection held by Luton Culture, Wardown Park Museum, Old Bedford Rd, Luton, LU2 7HA. It has been very difficult to view these hand axes as state of the art lethally sharp tools once perfectly suited to defleshing and skinning mammoths, reindeer and a whole range of other now extinct large wild game once present around Bedford. But the instant Will sat down, put his protective hide pad across his knee, picked up a raw flint nodule and began to hit it with the antler hammer the super sharp qualities of flint became very apparent. Razor sharp flakes fell off the nodule around Wills’ feet and with every considered and well aimed hit of the flint nodule a “new” Palaeolithic hand axe emerged. The finished axe that Will handed to me had very sharp edges and easily cut through a deer skin, I instantly appreciated what an essential tool to early humans this would have been. All of the axes that Will made whilst he was being filmed are very different in colour to the archaeological ones. The ancient hand axes have acquired the patina and staining of extreme age whilst the new ones are black from the natural colour of flint nodules. 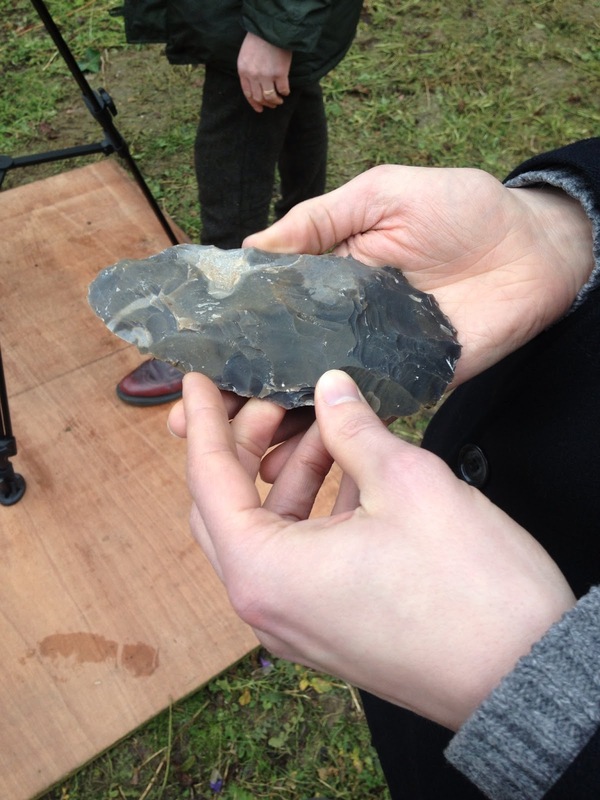 The film of Will making flint axes will be shown in a case housing ancient examples to demonstrate the skill of not only early humans in producing a flint tool which enabled them to survive but also the experienced and skill of a modern day man, Will Lord. by Liz Pieksma, Keeper of Archaeology, The Higgins, Bedford.